Do I Need New Tires? How Can I Tell? Tires are the true workhorses of your vehicle. They are literally where the rubber meets the road and they can take a real beating. 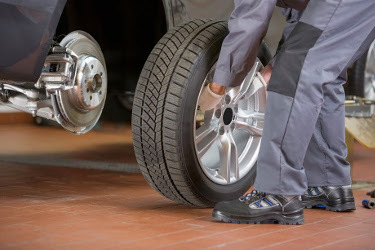 After a while of riding on new tires, you’ll need to ask yourself, “Do I need new tires?” A new set of tires isn’t exactly cheap, so it’s important to know when changing them out is necessary and when it’s not necessary. Worn down tires are just a fact of life when driving, but letting them get too worn down can be extremely dangerous. Worn down tires can cause you to completely lose control of your vehicle, especially in adverse weather or terrain. Keep your tread depth adequate. For normal driving in ideal conditions, 1/16 of an inch of tread is the lowest you should go. For driving in rain on a regular basis, twice that is the tread depth that you should shoot for. Pay attention to the tread indicator bar! Late model tires have a handy tread indicator bar on each tire. When the tires are new, you don’t notice it. When it’s time to change out your tires, the bar will be level with your tread. Don’t forget about the sidewall. Check the sidewall of your tires for cracks. This could be your first sign of an upcoming blowout. Bulges and blisters can spell serious trouble. This means that a tire has a serious weak spot and needs attention pronto. More-than-usual vibration can indicate misaligned or unbalanced tires, but it could mean that the actual tire has an issue. The best way to take great care of your car—and the tires that carry it—is to rely on the experts. At Tamaroff Nissan, we have plenty at your disposal. We can help you care for your tires and everything in between. Trust our qualified technicians to get your car running at its absolute top performance level quickly, affordably, and with high quality work. Contact us today to learn more and schedule your appointment. 0 comment(s) so far on Do I Need New Tires? How Can I Tell?